Just give it a couple of seconds to get set up. You are now part of a collaborative neural network painting project. What you see is a neural network's approximation of Leonardo da Vinci's masterpiece. If you're on this page, the network begins to use your browser resources to further train itself. The network itself is saved as a checkpoint after a predetermined number of training steps. Anyone visiting the page starts off from the network of the last saved checkpoint. 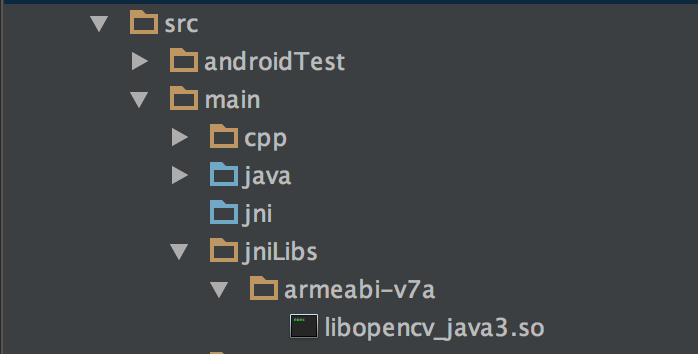 Create a directory jni inside app -> src - > main. This location should contain our native C++ source code. Go ahead and create 3 files. 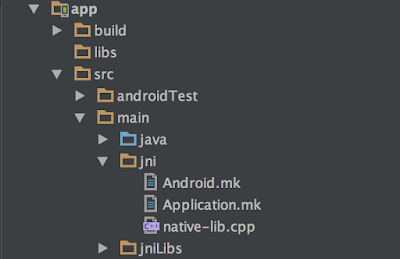 A C++ file here named native-lib.cpp, and 2 files named Application.mk and Android.mk respectively. 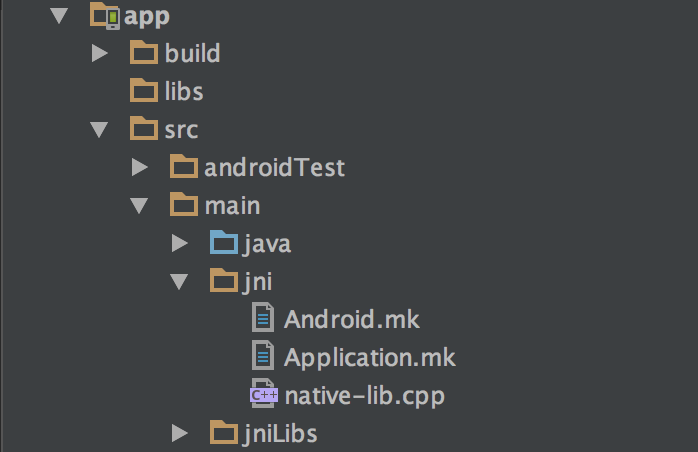 Add the following content into Android.mk, Application.mk and native-lib.cpp respectively. Also, in Application.mk , we mention which architecture we are building for (in my case, armeabi-v7a). You can change it as per your architecture. The code in native-lib.cpp simply takes an OpenCV Mat object (referenced by it's address) and runs Canny Edge detection on it, and saves the result back in the same address. If you want to know why the esoteric naming of methods in native-lib.cpp, it's because JNI needs to be given methods in that format. Read this to know more about this. We do this by first defining the native method in MainActivity.java just before the closing parenthesis. Note that the name of the method in Java and C++ are strongly correlated. C++ names are basically named as Java_packagename_classname_methodname. Make sure you are following this convention, otherwise things WILL break. 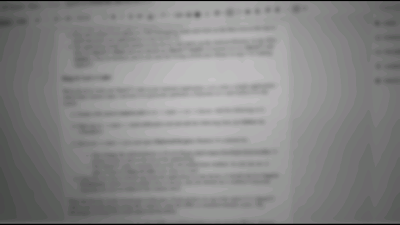 As can be seen, this code reads an image from the camera, converts it to greyscale, passes it to the native C++ code (explained above) and then returns the result back to the display. Now simply run MainActivity. 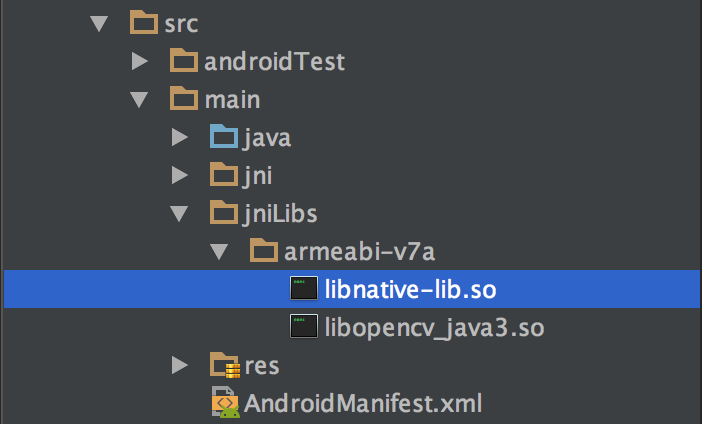 If the build goes correctly, you should see libnative-lib.so is added to the jniLibs directory under the architecture you're building for, and when the app is pushed to your device, it shows you realtime edge detection. Running the app. 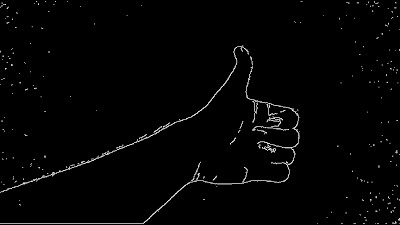 The thumbs up says it all! That's it! So now we have Android + OpenCV4Android SDK + native C/C++ code working together to perform realtime computer vision tasks. In fact, there are ways in which you can further improve performance of JNI, but let's talk about that some other time. 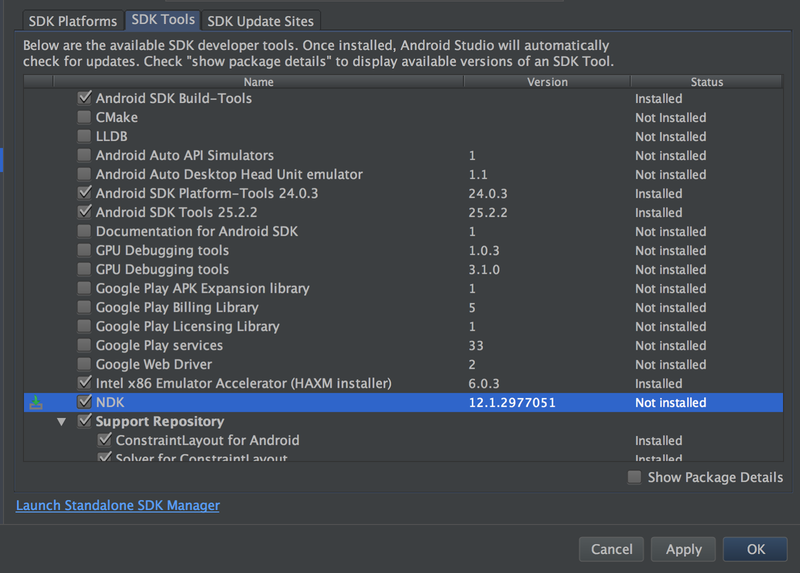 On first launch of Android Studio, it'll download all the latest SDK Components (Assuming you downloaded it without the SDK), platform-tools, build-tools etc. These are the components it offered to download for me. 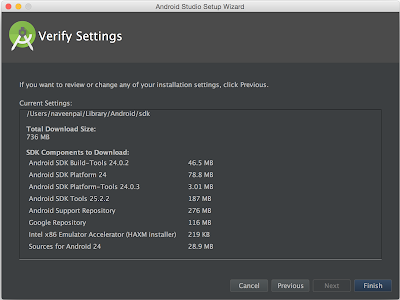 Note the build-tools version (Mine is 24.0.2, yours may differ), but you'll need it later on. Start a new project. Uncheck the checkbox that says "include C++ support". Next. 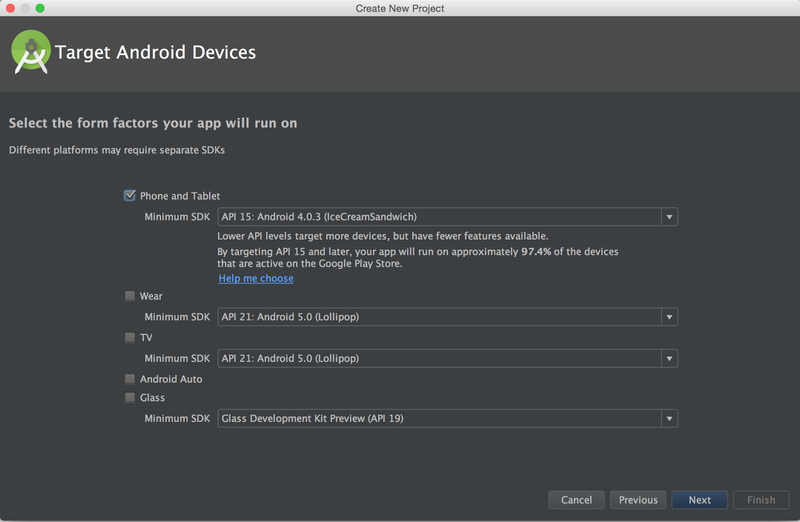 On Target Android Devices, choose Phone and Tablet with Minimum SDK Version as 15 (That's Ice Cream Sandwich!!). Next. Add an Empty Activity. Next. On the Customize the Activity screen, just click Next. Your workspace is now ready! 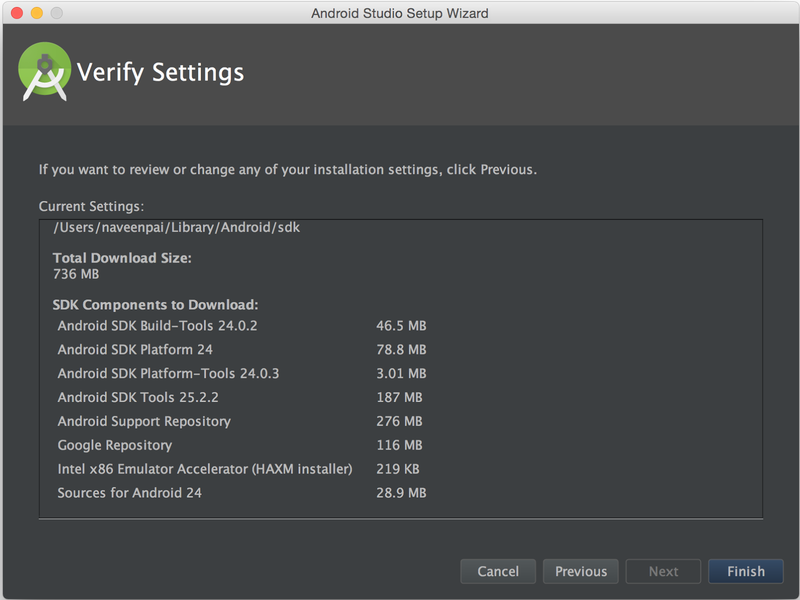 Go to Android -> SDK Manager. Under SDK Platforms, check Android 6.0 Marshmallow, which is API Level 23 . 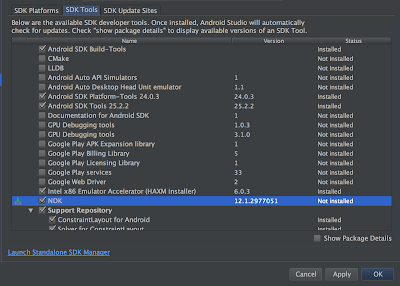 Under SDK Tools, check NDK (My version shows 12.1.2977051). Click on apply and it'll download the components. 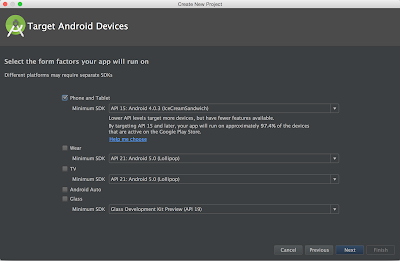 Once this is done, go to File -> Project Settings and click on Select default NDK for Android NDK location. This will populate the text field with the path to the NDK you just downloaded. Unzip the OpenCV for Android zip file into some location. 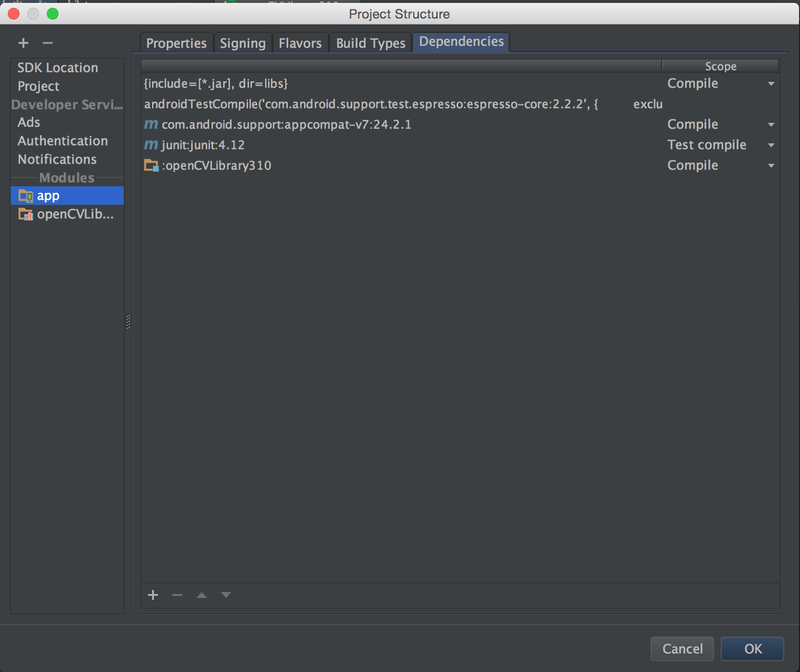 Go to File -> New -> Import Module and then add <OpenCV for Android Unzipped Path>/sdk/java as a module. You will probably get an error. Let's fix that. 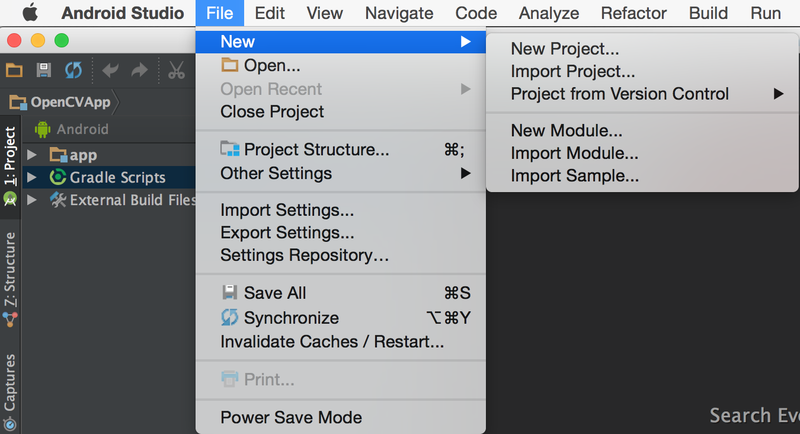 In the left menu listing the files of the project, you can switch from Android view to Project view (using the dropdown right at the top). Open the build.gradle file for the module you just imported (openCVLibrary310 -> build.gradle) and edit values to what's shown below. 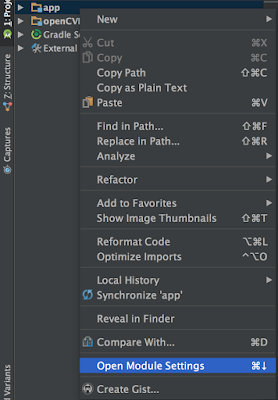 Make sure the buildToolsVersion is the same as what you noted down in step 2 of setting up. Then select Sync Now and all errors should disappear. 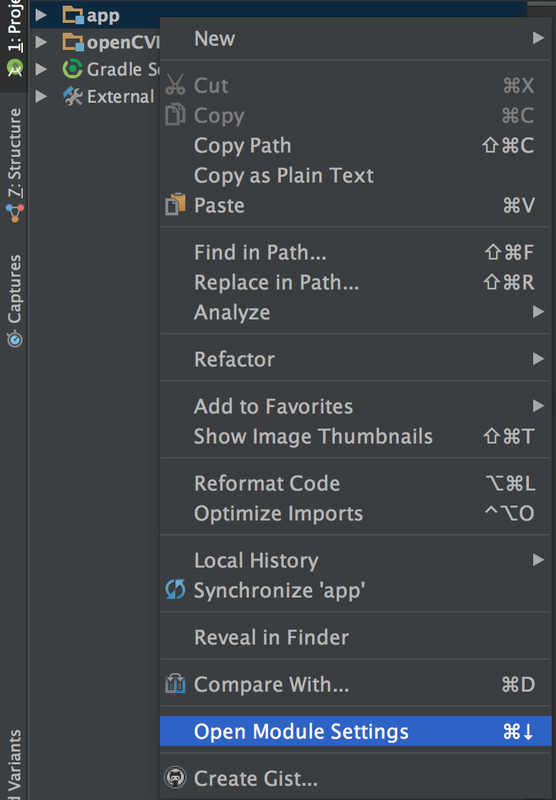 Right click on app in the left menu, and select Open Module Settings. 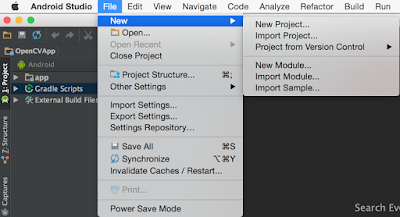 Select the module app, click on Dependencies, and then add the openCVLibrary310 as a module dependency onto app. 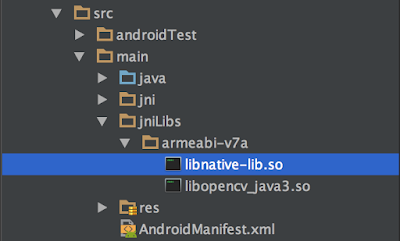 Create a directory names jniLibs inside app -> src -> main. In this directory we add the architecture dependent .so file for OpenCV. You'll find all the architectures supported in <OpenCV for Android Unzipped Path>/sdk/native/libs/ . 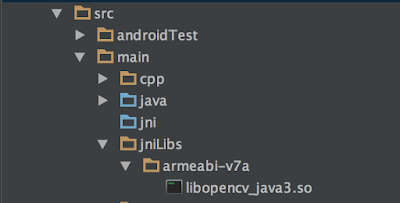 Choose your architecture (usually armeabi-v7a) and copy the directory into jniLibs. We only need the libopencv_java3.so file so go ahead and delete all the other files. Now just connect your phone in USB Debugging mode and click on the Run icon at the top to build and push your application to your device . The application builds and pushes to the device and opens up the Android Monitor. In the filter, filter by OpenCV::Main and you should see OpenCV loaded. If instead you see OpenCV not loaded, it may be because you've use used the wrong architecture library in step 3 of Adding OpenCV. We're all set to write our OpenCV code in our Android Application. 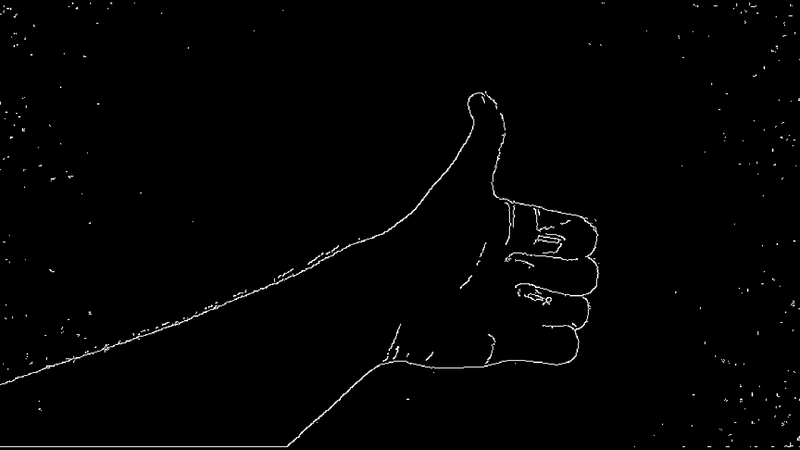 Let's write a simple application which takes camera input, converts it to greyscale, performs a Gaussian on it and returns it to the screen. Create a file named camera.xml in src -> main -> res -> layout. Add the following in it. The OpenCV code is actually all on the onCameraFrame method. As you can see, it takes a total of 2 lines of code to do what we want! Click the run icon to rebuild and push the application to your device. It should ask for Camera Permissions, which we just added. Give it access, and you should see a realtime Grayscale Gaussian-ed view of whatever the Camera sees! If you're new to all of this, read this tutorial! 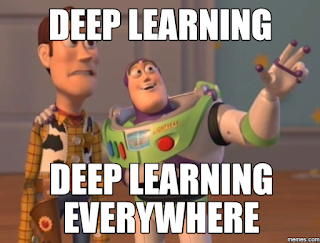 The Deep Learning ecosystem has matured tremendously over the last few months or so. I've been playing around with some of these applications over the same time period as well, and it's amazing how much the field has moved ahead in such a short time. Today, terms like Word2Vec, CNN and LSTMs have became part of the lingo of nearly every researcher, hobbyist or otherwise. Misc. tools like tmux which are a godsend for remote development. 1) Get yourself an AWS EC2 instance. This is a shell script which installs all the required dependencies and libraries required. This is a shell script which tests to ensure that the install is successful. This is a small python script which tests to ensure Theano is using the GPU for it's computations. 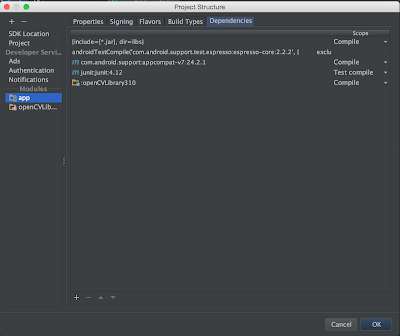 This will take some time (~5-10 minutes) to download and install all the dependencies. If a pink screen pops up mentioning "A new version of /boot/grub/menu.lst is available", choose "Keep local version" and select OK.
Just look for the messages in green and ensure the output matches it. And... that's it! 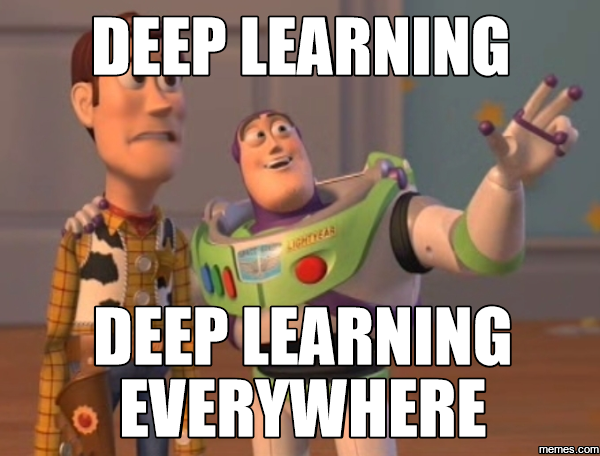 You're all set to start developing your own deep learning applications on AWS EC2. Here's a set of examples you can get started with. Notes: Why both Theano and Tensorflow? Because choice. Honestly, thanks to Keras, using either as a backend is as simple as a string change. Also, most early to mid level posts in the field use one of the two with no strong monopoly, so it simply made sense to have both of them.